The latest version of my AD reporting tool, which now includes command line support and email support, is now available. As mentioned previously, the main new feature in this version is the ability to run queries from the command line and either export the results to file or email them. 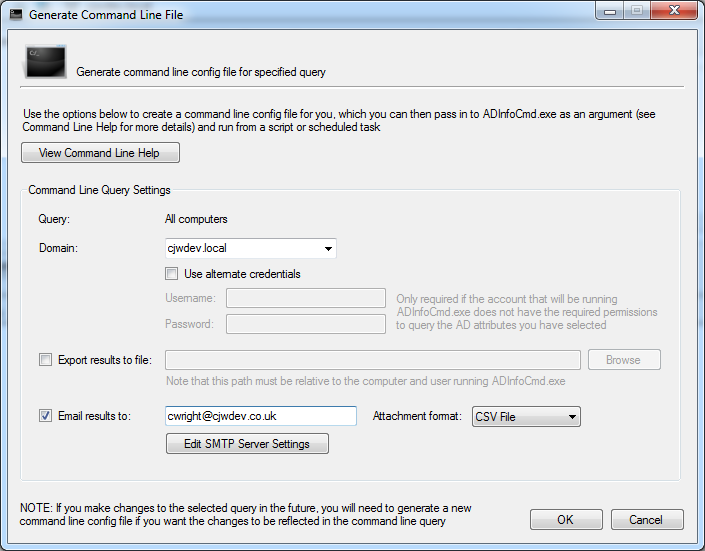 To run a query from command line you’ll need to generate a command line config file for it from the GUI, which essentially just involves entering any required values for query parameters that prompt for a value, and then selecting which attributes you want to include in the results, just like you would when running a query normally. You’ll then see this window, which lets you select command line specific options such as emailing results. As always, this update is free to anyone already using AD Info (note that this update is for the standard edition only). If you’re already using the standard edition then you can just go to Help –> Check For Updates, to download it. So I would now be able to have a report run every night? wohoo!